Montreal's art and science organization the Daniel Langlois Foundation announced a new collection of online materials for Canadian artist David Rokeby's work Very Nervous System (1983-), an interactive sound installation that reacts to the movement of visitors. The work has developed over the years, and has exhibited in many contexts. This particular collection of documentation is interesting because they bring in the audience's response to the work, through a series of interviews. You can read more about the project and their approach in the excerpt below from the "Introduction to the Collection" by Caitlin Jones and Lizzie Muller. This is the second documentary collection that we have created for artworks by David Rokeby. In 2007 we produced a collection for the artwork Giver of Names (1991-), through which we developed a documentary approach to media art that captures the relationship between the artist’s intentions and the audience’s experience or, as we have described it, “between real and ideal” (1). The aim of this strategy is to acknowledge the fundamental importance of audience experience to the existence of media artworks and to create a place for the audience within the documentary record. We believe this approach offers a productive way to reconcile how media artworks exist in the world and how they are represented in an archival context. In recent publications, we have begun to refer to the product of this approach as an “Indeterminate Archive”: a collection of materials that provides multiple perspectives of the work, as well as multiple layers of information, held together with—but not secondary to—the idea of the artist's intent (2). This indeterminate archive, we have argued, captures the mutability and contingency of the artwork’s existence, creating a more, not less, “complete” account. For a full explanation of how we developed this approach as well as a fuller discussion of the issues surrounding documentation, archives and audience experience, please see the introduction to our 2007 collection for the Giver of Names on the Daniel Langlois Web site (3). The invitation to produce a second collection for Rokeby’s Very Nervous System (1981- ) came from the Ludwig Boltzmann Institute Media.Art.Research in Linz, Austria. This artwork is a particularly interesting case study for the Indeterminate Archive for two reasons. Firstly, it offers an unmatched demonstration of the importance of experience in media art. Very Nervous System is, as many audience members pointed out in our interviews with them, essentially an empty room until someone walks in and activates it. It is a work that is brought into being very literally through experience. Secondly, it is a seminal work in the history of media art, with a lifespan of more than 28 years. Its celebrity and longevity pose some particularly interesting questions about documentation and contextualisation of media artworks over time and through change. The Very Nervous System’s celebrity makes it a fascinating focus from the point of view of the relationship between real and ideal. 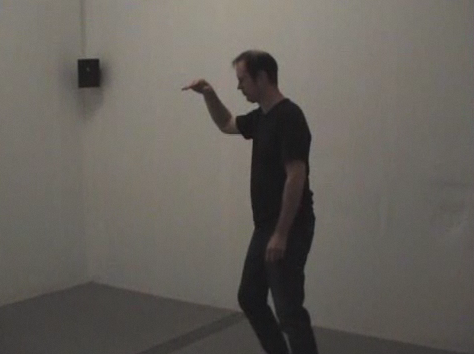 The work is, for many, one of the first successful artistic experiments in gestural, embodied interaction. An enormous number of texts have been written about it, and many curators and critics of media art have read about it without ever having experienced it themselves. This notion of an “ideal” Very Nervous System has, therefore, a powerful role within the discourse of media art. This begs the question of how the “real” individual experience of the work, here and now, relates to this powerful ideal.